It’s been five years since the final ‘Harry Potter’ film was released and the popularity of the books (and the films) hasn’t really subsided to any great degree as the ongoing success of various attractions related to the series can testify too. With that in mind, future films based in the wider universe don’t come as much of a surprise, and ‘Fantastic Beasts’ (based on a novella written for charity around 15 years ago) is a good introduction into a different locale and time period for the wizarding world. 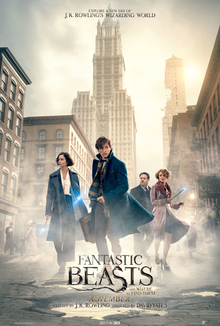 The film’s protagonist switches from Harry Potter to Newt Scamander (a magizoologist and a bit of an oddball), who is mentioned on occasion in the original series, and the location is switched from the UK to New York City in the 1920s. J.K. Rowling wrote the screenplay herself so my hopes were fairly high that this could expand the world in new and interesting ways, and whilst it does to an extent, ‘Fantastic Beasts’ feels merely good and not great. The crux of the film’s narrative focuses on Newt (Eddie Redmayne) visiting New York with a suitcase full of magical beasts, when the suitcase accidentally gets switched with that of a local baker (Dan Fogler). Ignoring the fact the suitcase switch is the most obvious option available, it does work quite well and it brings in a No-Maj (we call them muggles this side of the pond) into the orbit of the film’s magical characters which include Newt but also several characters from MACUSA (the American magic authority). Meanwhile across New York, a dark force has been sweeping through buildings and causing havoc, threatening to reveal the magical world to the rest of the population. Both stories crossover to a certain extent, but I found much more to enjoy in the fun and goofy world of the magical creatures than in the darker elements which were less interesting and felt like they were mainly included to hint at future films in this particular series. Redmayne is solid and likable as Newt Scamander and I particularly liked Dan Fogler as Jacob Kowalski, the baker with the mixed up suitcase. It does feel like many of the other characters get short shrift, and one can only imagine Carmen Ejogo and Jon Voight for example have been cast on the basis of future films as opposed to their reduced roles in this outing. The magical creatures themselves are mostly great and well realised on screen, although the film probably could have been a little tighter in some spells and an obvious cut could have applied to some of the time introducing the characters within Newt’s suitcase (mainly the ones not relevant to this film). The attempts to start off a couple of love stories don’t work well either and I particularly didn’t buy the attempts to drill some chemistry into Newt and Tina’s (Katherine Waterston) interactions, nor did it feel strictly necessary in a film spinning several other plates at the same time. When ‘Fantastic Beasts’ focuses on the lighter elements of its story, it’s a joy to watch with a lot of laughs, fun set pieces and a return to a fascinatingly well crafted universe, and on that front I definitely enjoyed the film. To achieve greatness it would have needed to get a better handle on the darker material on display and I didn’t feel it ever really did, which is a shame as this is something the original series often did incredibly well. That being said, as an entry point to a new franchise in this world, I’m fully on board.